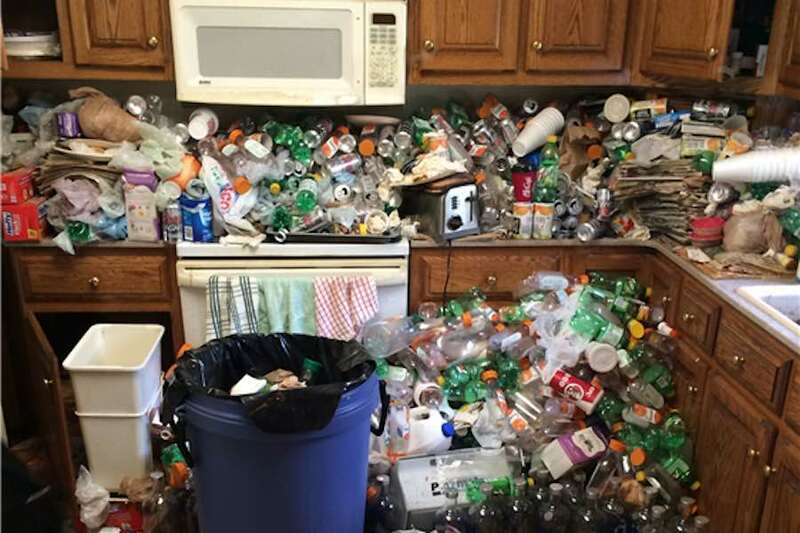 * Looking For A Professional Hoarder & Squalor Cleaning Service In Tasmania? We want to be your cleaner of choice - let us know what it will take to win your business! Clutter and hoarding can be a challenge for people of all ages, but especially the elderly.. When a large collection of items has accumulated to the extent that the house has become difficult to walk through and for the home owner to easily and hygienically function within their home, steps should be considered. Hoarded items can create safety issues for the home owner as well as visitors, and can cause the home owner to be overwhelmed. Local Tasmanian cleaning company Best Clean hoarder and squalor cleaning service can provide active and compassionate support for clients in need, assisting them to sort through their possessions whilst actively decluttering their home. In a sensitive hoarder cleaning situation, the client is in full control of the clean. Their items are only discarded if the client agrees it is necessary. A thorough hoarder clean service can be initiated after the first step of decluttering has been achieved. Best Clean hoarder and squalor cleaning service staff are trained be guided by the wishes of the client. For a variety of reasons, including mental health challenges, a person or family can often find their home has become increasingly cluttered and in an unhygienic condition. This can mean there is a large accumulation of items of general possessions, rubbish, old food scraps and even in the worst scenario excrement. Living in a squalor home environment can put the wellbeing and general health of the home occupants at great risk. Best Clean hoarder and squalor cleaning service provide decluttering & cleaning services that can see the home being restored to a place in which the occupants are not longer at risk from the unhealthy home environment which they find themselves in. A skip bin can be ordered to assist with large amounts of rubbish removal. A thorough clean is done to create a comfortable and most importantly hygienic home. A big thank you for the great job you did for us with our lounge room carpet! Great service, lovely polite and friendly staff! Would and will be recommending you to others! Again thank you! My carpets look absolutely amazing!I was stunned, and the heat pump looks brand new!! Beat Clean team you guys are fantastic! One happy person right here. Burnie & surrounds (incl. Ulverstone, Devonport, Wynyard, Penquin & Somerset). If you're searching for a professional cleaning company in the Burnie area, then contact Best Clean Carpet Cleaning for quality cleaners within the residential, commercial and industrial sectors. Our family-owned business provides a wide range of cleaning services - from carpet and tile cleaning to crime scene and biohazard cleaning. 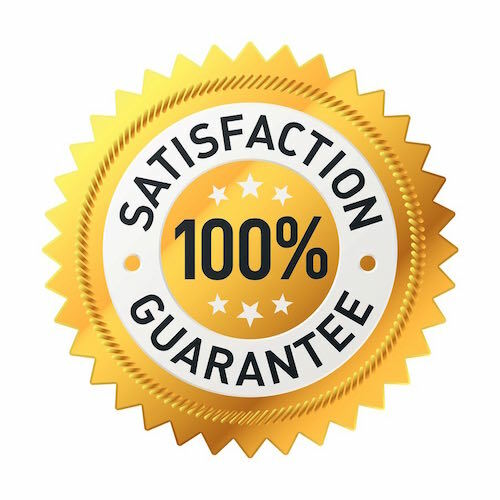 Offering specialist services from a team of qualified and dedicated cleaners, we guarantee quality results on every job, and we offer free quotes for your convenience. Whether you need your home or office cleaned, or would like a thermal imaging inspection to check for damp, we can do all this and more. 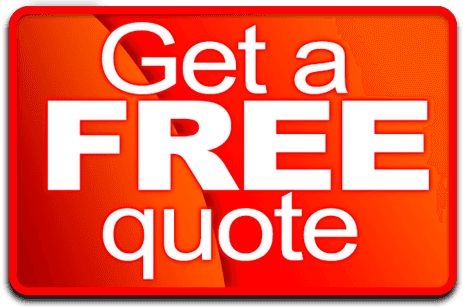 Just give us a call today and we'll make your property clean and fresh again in no time. 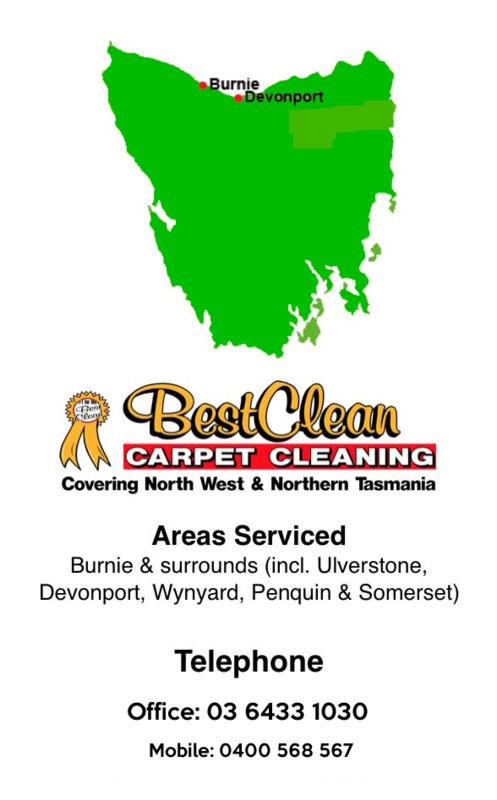 If you're searching for a professional cleaning company in the Burnie areas, then contact Best Clean Carpet Cleaning for quality cleaners within the residential, commercial and industrial sectors.